We hear it, but don’t see it; however, soon we will feel it. The world is facing a growing problem where a range of resources are growing scarcer as populations increase. This emerging middle class, growing to 5 billion by 2030, is placing placing a higher demand on physical resources like food and water. As a business, global competition for in-demand resources, ranging from leadership to metals, are forcing companies to bring efficiency and resource optimization even closer to their core strategy. The urgency is there to address these issues and the answers are more available than we think. 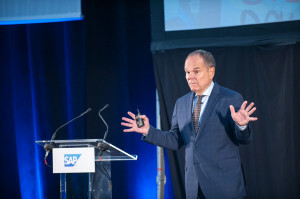 In a previous blog I shared I recently had the opportunity to attend an event where Don Tapscott was one of the keynotes. He shared that through the Power of Networks we may have an opportunity to begin solving the world’s most pressing problems. All of these things, powered by the platform of the Internet, provide access. Access to new leadership, to new markets and revenue, to insights, to physical resources, and they’re all connected. The Arab Spring is most frequently referenced as the example for the power of social media. While it wasn’t what caused the revolutions that rippled across the Middle East, it was the messaging medium by which networks were built. It was the window many used to scream their messages out of, as they desperately sought new leadership. They used social networks for more than sharing videos of corruption by the police and military forces in their cities. It became a makeshift healthcare. Many in the hospitals injured as a result of rising against the government and taking action, would enter with an injury and never come out. By using Twitter, when someone was injured they could tweet their location and injury, then the injured would be picked up and taken to a makeshift hospital and treated safely. Mobility is more than enabling your workforce; it’s a platform for small business owners and entrepreneurs in developing nations. Don shared with us the story of when he visited Africa he met a young girl, only 14 years old. Married to a 65 year old, neither of them had an easy way to get water so instead they drink their goat’s milk. But, she had a mobile device with access to the Internet in the middle of her fields. With the access she had came the opportunity to sell her goats or their milk; bringing in revenue for herself, her two children and husband. This is incredibly disruptive. Big Data offers a world of opportunities, and according to Don it’s changing the way we learn. He referenced Millennials, often accused of being the stupidest generation due to a reliance on search engines and the Internet for answers. However, Don argued that this reliance on digital technology is actually allowing these young people to socialize the data using their own human understanding. The Internet is creating a platform of communities, and these communities form networks. These networks enable businesses to find vendors who bring to the table the very best product for the price. Never before has this concept been achievable, but now, with the Internet, these business networks offer a unique opportunity for the supply chain, specifically for resource optimization in businesses. In one of Don’s blogs, he shares the cloud “speeds up economic metabolism and enables innovation based on previously unimagined levels of collaboration.” The cloud is the connector, linking all devices as well as making data accessible on those devices. In turn, this creates a culture of collaboration in those communities previously mentioned. While later on in the blog he shares that cloud is still not totally trusted, providers are moving quickly to try and make it as secure as possible. While we still have things like automobiles and vacation homes sitting idly, networks driven by these 5 things, are beginning to help reduce the consumption. They are also helping divert resources to areas and businesses that are lacking.